In 1987, E. Morris Sider wrote More Than Names: The Story of John and Barbara Martin. When the book was published, this important family photo was not available and thus not included in the book. I (Althea) found the photo in a cousin’s file and researched the family connections. I recognized several relatives, but the only one that I thought was still living was Esther Heisey, a member of the Lancaster Brethren in Christ Church where I grew up. 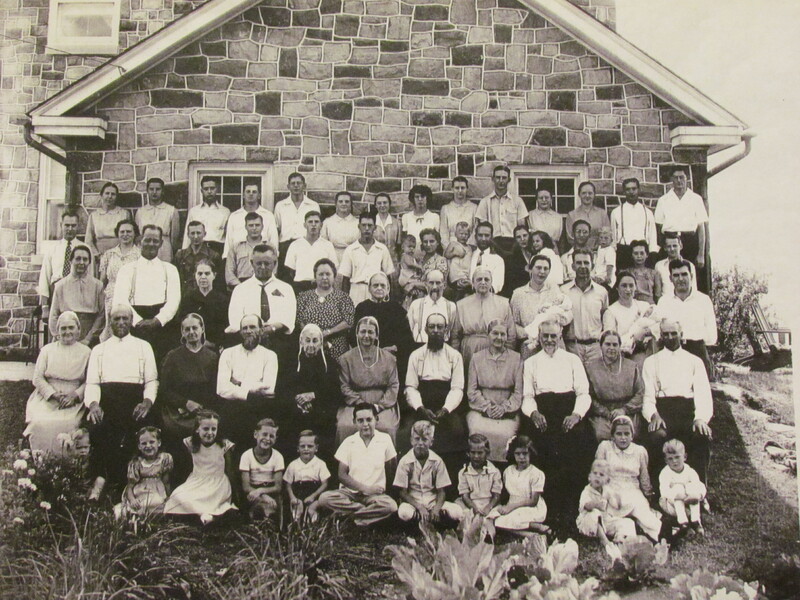 With her help I contacted other relatives, who helped identify everyone else in the photo. The context for the photo: In 1858, Mary Wolgemuth was born into a Brethren in Christ farm family. In 1880 she married Eli Musser and they lived on his family farm near Florin, PA. They had five children from 1881 to 1896. Eli died in 1896 at age 37, leaving Mary to run the farm and raise the children. Son Irvin, at age 15, took much responsibility for the farm, and together they made the farm prosper. Irvin later inherited the farm and raised his family there. Mary then married Ben Nissley after his wife passed away, and they lived in Florin. When Ben died in 1929, Mary went to live with her daughter, Mary Forry, near Mount Joy. About 1940, she moved to Lancaster to live with her daughter Barbara Martin’s family. In 1945, when Mary was 87, the family decided to invite all of her descendants to gather for a reunion at Roy and Mary Martin’s home. 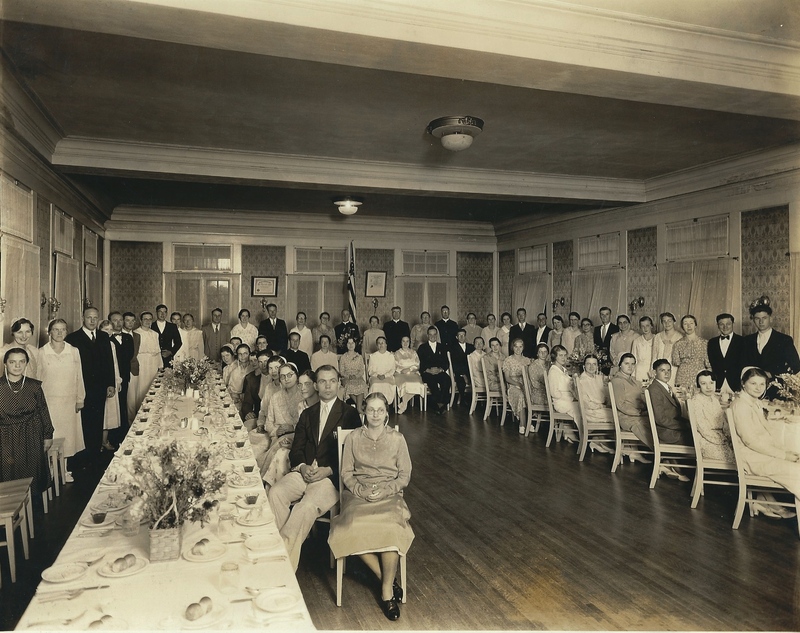 On September 8, 1945, about sixty-five people came together to share a meal and fellowship together. Mary had agreed for a professional photographer to be hired to memorialize the event, although her picture had never been taken before because it was considered a “graven image.” That evening, Mary retired to her room at Barbara’s home. She was found in her bed the next morning, having died peacefully in her sleep. 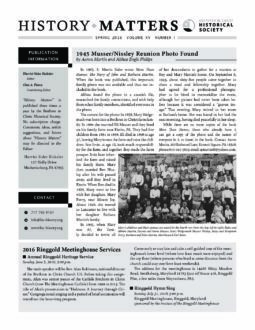 Sunday, June 5, 2016; 3:00 p.m.
Mark your calendar for Sunday afternoon, June 5, and plan to attend the Ringgold Heritage Service, sponsored by the Brethren in Christ Historical Society. The service will be held at the historic Ringgold Meetinghouse on Sunday afternoon, beginning at 3:00 p.m. The main speaker will be Rev. Alan Robinson, national director of the Brethren in Christ Church U.S. Before taking this assignment, Alan was senior pastor of the Carlisle Brethren in Christ Church (now The Meetinghouse Carlisle) from 1999 to 2013. The title of Alan’s presentation is “Holiness: A Journey through Crises.” Congregational singing and a period of brief testimonies will round out the hour-long program. Come early or stay late and take a self-guided tour of the meetinghouse’s lower level (where love feast meals were enjoyed) and the top floor (where persons who lived at some distance from the church could stay over love feast weekends). The address for the meetinghouse is 14426 Misty Meadow Road, Smithsburg, Maryland 21783 (just off Route 418, Ringgold Pike, a few miles from Waynesboro, PA). 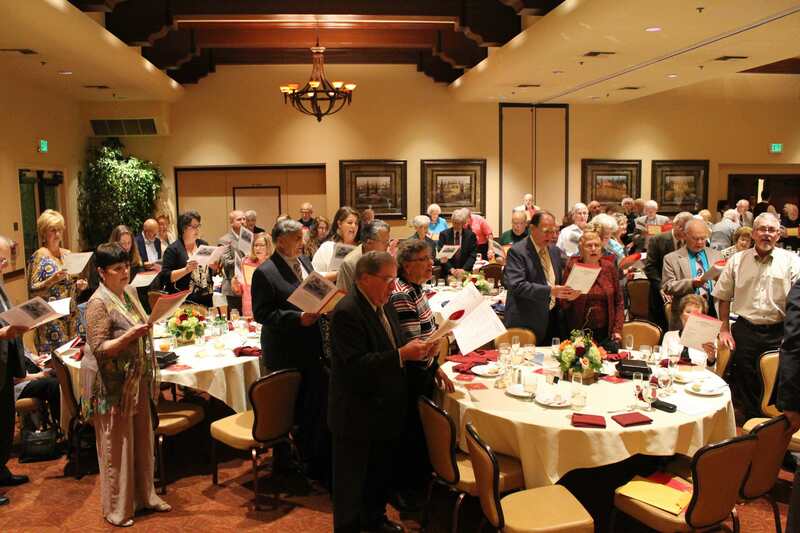 Sunday, July 31, 2016; 5:00 p.m.
Editor’s Note: On November 8, 2015, over 120 Upland College and Messiah College alumni gathered in Rancho Cucamonga, California, to mark the fiftieth anniversary of the closing of Upland College. Several alumni participated in the evening’s program, including Daniel Chamberlain (’53) who gave the main address (condensed version below). For more about the event, see the blog post by Jon Stuckey, director of development at Messiah College. I was just 16 when I left my missionary parents and family in Jamaica to become a freshman at Upland College. I traveled first to Miami by plane where I boarded a bus for the overland trip to California. I carried only my trombone and a very small suitcase which fit easily under the seat of the airplane and then of the bus I took to California….That inauspicious start was for me the beginning of four exciting and life-shaping years at Upland. I had many challenging classes; I played intercollegiate athletics; I was able to develop leadership skills; I had the joy of participating in intercollegiate debate. Today I speak for all Upland alumni in expressing gratitude to Messiah College for perpetuating the name and the legacy of Upland College for the past half century by having the Alumni Association bear both the Upland and Messiah College names. 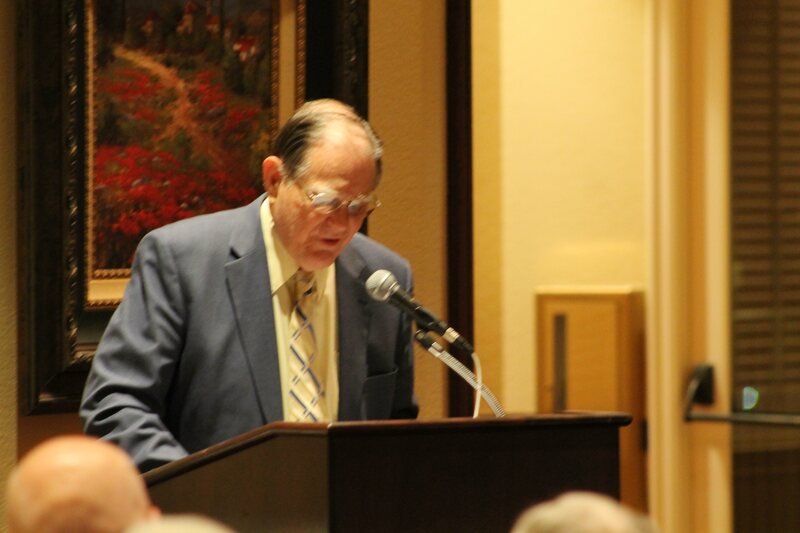 Just over fifty years ago I announced the creation of the Messiah/Upland Alumni Association. The Messiah College Alumni Association traces its origin to 1919, when my father-in-law, Benjamin Musser Books, urged the formation of such an organization and became its first secretary. A year later he became a member of the founding faculty of Beulah College, and in 1922 he organized and became the first president of the twelve member Beulah College Alumni Association which in 1949 became the Upland College Alumni Association. Forty years later in 1962, I was elected president of the Association and thus became, so far as I know, the only person in Upland’s history to have served as class president, student body president, acting president of the college and president of the alumni association. Those multiple ties between Upland and Messiah were further strengthened in 1968 when I began an eight-year tenure as the Academic Dean of Messiah College. A generation later we forged additional bonds when four of our children became Messiah College alumni. For the past fifty years Messiah College and its Alumni Association have provided many valuable services to Upland College alumni. Upland alumni have been invited to participate in Messiah College alumni activities. In addition, special events have been planned and implemented for Upland alumni, and alumni have made many valuable contributions to Messiah College, including serving as faculty members, administrators, and trustees for Messiah College. Upland College served students from its founding in 1920 until its merger with Messiah College in 1965. Forty-five years is a relatively short lifespan for an educational institution, but the significance of a college should be measured by more than its chronological duration. Upland College can be justifiably proud of innovative programs such as midyear seminars and the interdisciplinary team-taught general education program. Upland took full advantage of its size to integrate faith with both life and learning and to stimulate campus-wide communication through weekly faculty seminars and daily all-school conversation periods. Upland was also a leader in founding the Council for the Advancement of Small Colleges which eventually developed into the highly influential and important Council for Independent Colleges and Universities. Organizations are best judged by their effectiveness in achieving their stated purposes. “A vision for service” was more than a slogan for Upland alumni; it was a way of life. We learned by precept and example that any abilities we possessed were gifts from God, and good stewardship demanded their development and their deployment to serve God and others. That combination of love for God, love of learning, and devotion to service is captured in the Messiah College alma mater which uses the same tune as did the Upland alma mater. From this day forward, alumni from both Upland and Messiah will join in singing this singular anthem which it was my honor to compose. Hail Messiah College hail, honored alma mater. Taught with faith and ardor. Ties we ne’er will sever. Christ to serve and to honor thee. Pictured is the newest piece of equipment in the Archives – a BookEye 4V1 cradle scanner. The large overhead scanner accommodates flat documents, using a motorized two-part platen, as well as fragile bound documents, using the protective V-cradle for more gentle scanning of books, photo albums, etc. In the first photo, Libby Erisman (one of the three Messiah College students who work in the Archives) is shown digitizing one of the larger books in the Brethren in Christ Church collection: the Messiah Rescue and Benevolent Home Minute Book for 1896-1905. The book is too fragile to scan using a flatbed scanner; that would require the repeated process of laying the book face-down to scan two pages, picking it up and turning the page, and placing it back down on the scanner for the next scan. 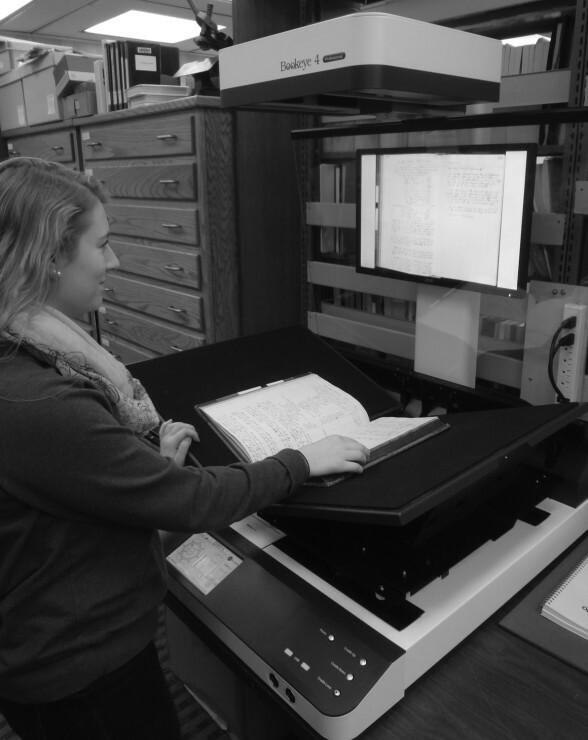 But when the minute book is placed on the V-shaped cradle as shown on the photo, scanning is easily done two pages at a time, with Libby simply turning the pages for each successive scan. In either the “V” mode or the split cradle flat mode, the overhead scanner can accommodate a bound volume more than 4 inches thick. In addition, the scanner can scan flat documents as small as four inches square up to a maximum of 25 x 33.5 inches in size. 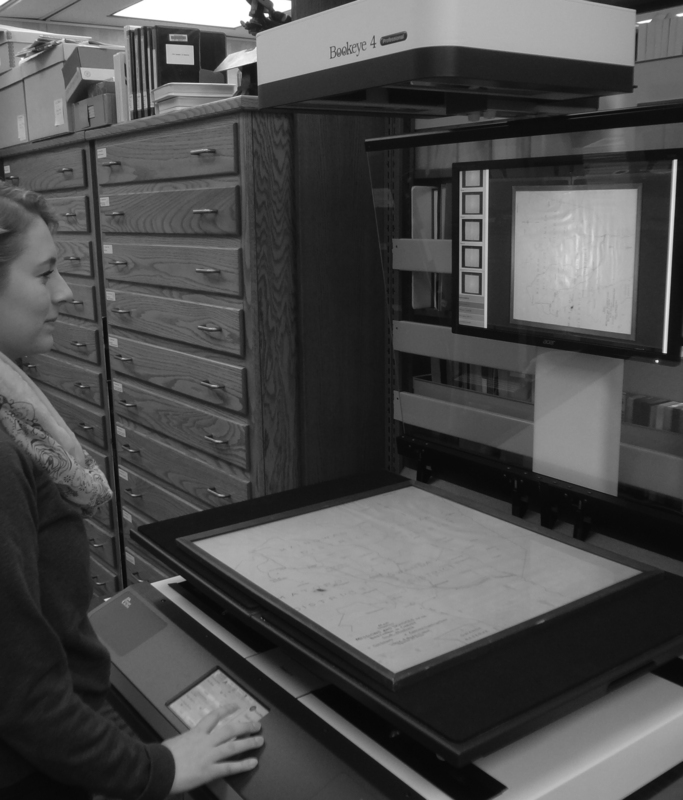 The large format makes it ideal for digitizing large maps, photographs, and blueprints that are in the Archives’ collections. The second photo shows Libby scanning a 21″ x 23″ map of mission stations in Southern Rhodesia, hand-drawn on cloth and mounted in a frame. This versatile overhead scanner is a welcomed addition to the Archives, and joins other equipment such as an open-reel tape deck and a high-resolution slide transparency scanner which are used to digitize various items that are in our collections. Over the last few years, I’ve been privileged to facilitate a conversation with Galen and Sara Lenhert regarding the needs of the Brethren in Christ Archives. They possess a deep appreciation for its important work to preserve the religious, cultural, and social history of the Brethren in Christ Church and Messiah College. After learning how a cradle scanner would better facilitate archival work, they graciously offered to purchase the item for the Archives. This is not the first time they have supported the work of the Archives. Just a few years ago, they provided a significant matching grant for the Archives’ endowment fund to help secure its work into the future—an endowment which the College is committed to growing and hopes others will want to support! For more information about the Archives’ Endowment Fund, contact Bob Brown, Messiah College, One College Avenue, Suite 3013, Mechanicsburg, PA 17055. Phone (717) 796-5051. Brown is director of planned giving and leadership at Messiah. This photo was found without any identification except the name of the photography studio in a collection of old photographs from Lewis and Gladys (Bohen) Sider, both graduates of Beulah College (Gladys from the academy and Lewis from the college). We contacted Curtis Byer, longtime resident of the Upland, California area where Beulah College was located, for his help in identifying the date, location, and individuals in the photo. After perusing more than ten years of Echo yearbooks, Curtis determined that the photo was probably taken in 1932; he wasn’t sure about the location. With the help of a magnifying glass and the Echo yearbooks, he was able to identify most of the people in the photo. If anyone has any additional information about the photo, please contact us.